Where are all my South African peeps? Hope we've got them on Entclassblog.com? If you are in South Africa, then you can enjoy MTN 1GB free data right now, to browse your favorite sites. Without saying too much, let's go straight to the point. 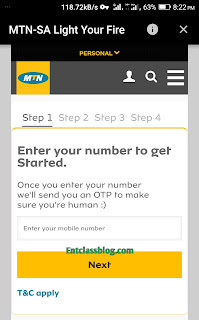 After downloading the app, register with your MTN SA phone number and activate your account. After that, MTN will credit your line with 1GB data. The data is valid for just 24 hours, so make use of it before it expires.